Summary: With the Esprit MOTIV-8 indoor spinning bikes have hit a price point which is closer to the more traditional models. You won’t need to compromise on quality with this great looking home spinner either. What stands out is the flexibility. While this is not a gym-sized monster, it does have adjustable handlebars and seat. Combine that with the innovative saddle (worth a look!) and pulse rate monitors and the Esprit Motiv-8 shouts ‘great value’ in a crowded market. Feedback has been solid for this bike compared to other budget models. See this dedicated amazon.co.uk product page for the buyer reviews and full picture gallery. Lose weight, build up your stamina, increase your speed. This budget indoor bike is flexible enough for gentle sessions or high intensity workouts (HIIT). You’ll get a classic angular spinning bike look. This is mostly black, with red trim and metallic grey parts. Like all bikes in this category the flywheel is open at the front, with a guard for the chain to make sure it wont get in the way. The saddle is worth seeing. This is also black and red. It has an ergonomic design – I’d almost like to say ‘aerodynamic’, though of course, with a stationary exercise bike there is no air rushing past. Some people prefer a big cushioned gel saddle with their indoor bike. Both the handlebars and seat have an adjustable setup with 5 spots on each. This gives the Esprit Motiv-8 more flexibility than most for the size of users. The maximum user weight is listed at 120kgs – that is almost 19 stone. Both tall and shorter users have said they had no problems with using this exercise bike in the feedback / comments. One unusual feature on this spinning bike is the emergency stop. You’ll see on the picture that there is a large red button within easy reach on the main diagonal support bar. These are common with treadmills. It is nice to see one with a spinner! There is a pulse meter. This is connected to sensors which are in the middle of each handle bar. Your pulse rate gets displayed on the centre console, along with the regular read outs. Those include distance travelled, speed – plus those all-important calories. You won’t find this console fancy (or connected to iPhones / Android phones). For the price point of this bike, the setup of stop / pulse meter / simple and clear display ticks all the boxes you’d expect. 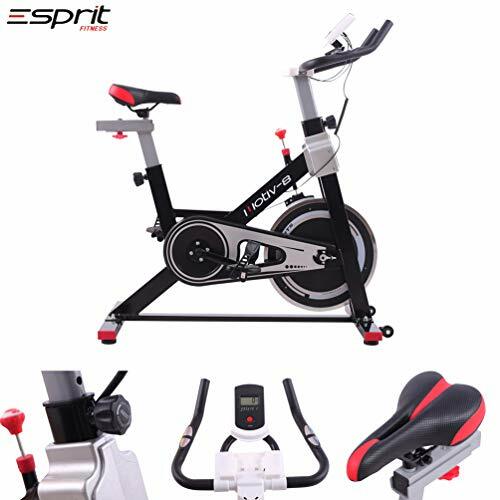 Feedback: What Previous Buyers Said about the Esprit Motiv-8 Spinning Bike? When you get the budget prices, most exercise bikes have what I’d call ‘mixed’ feedback. The Esprit Motiv-8 on the other hand, seems to have met or even beaten people’s expectation. With many people expecting budget fitness equipment to match what they are used to in the gym, that is quite an achievement! A common theme that runs through the comments is that people felt they had a good value buy. This bike is small, yet sturdy and versatile. No big deal about putting the different parts together for this model either. As always, feedback does change over time. I urge you to read the customer reviews of the Esprit Motiv-8 before you buy. Wrapping Up: Is the Esprit Motiv-8 the Right Budget Spinner Bike for You? This is a popular spinner – and certainly looks the part. For a budget price you get a lot of flexibility. There is a stop button, pulse meter, adjustable setup and enough resistance to give you a HIIT workout (or a gentle bike ride if you prefer!). Feedback for this model is excellent, especially when you compare this to other budget level equipment. Check out this product page for the full spec and latest pricing now!